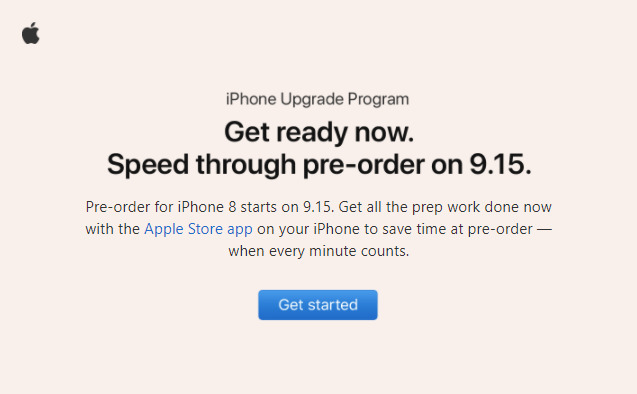 Apple has begun sending emails to people in the iPhone Upgrade Program, urging them to do "prep work" to be sure they can pre-order an iPhone 8 this Friday morning. "Pre-order for iPhone 8 starts on 9.15," an email seen by AppleInsider reads. "Get all the prep work done now with the Apple Store app on your iPhone to save time at pre-order — when every minute counts." Although November's iPhone X may divert some shoppers, many people are expected to crush Apple's website starting at 12:01 a.m. Pacific time on Friday, hoping to get an iPhone 8 delivered at the product's Sept. 22 launch. In the past, launch-day iPhone units have often run out hours or even minutes after the start of pre-orders. The Apple Store iOS app may be the fastest way for iPhone Upgrade Program customers to check for eligibility, since it can automatically scan for a device's serial number and IMEI. The process is also available on the Web, but requires signing in with an Apple ID and/or entering numbers manually. At the price of trade-ins and monthly fees, the Upgrade Program lets people switch to a new iPhone every year, covered by an AppleCare+ warranty. Because iPhones have become more expensive in general however, the minimum cost of the program has risen to at least $34.50 per month for a regular iPhone 8, and $39.50 per month for an 8 Plus. While largely similar to the iPhone 7, the 8 is equipped with things like a faster A11 processor, Qi wireless charging, and camera improvements for augmented reality and better video shooting. Plus models not only have a dual-lens camera but access to a beta Portrait Lighting feature.